Canning Applesauce - Fancy flavors from all my friends!! - Canning Homemade! 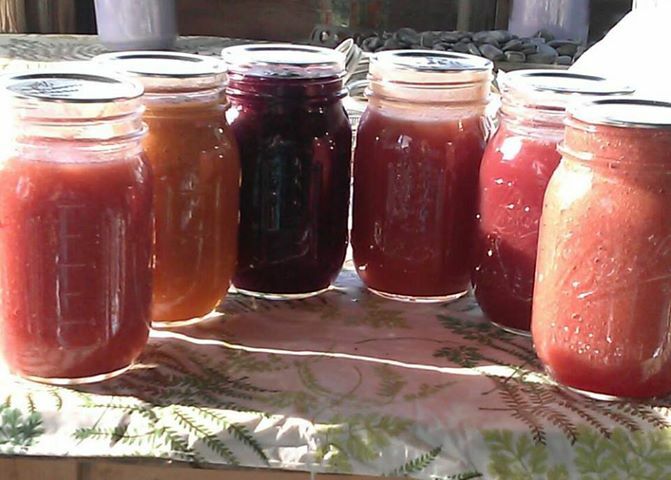 Home » apples » Apricots » Blueberries » Cherry » Peaches » Plums » Raspberry » Strawberry » Canning Applesauce - Fancy flavors from all my friends!! Canning Applesauce - Fancy flavors from all my friends!! 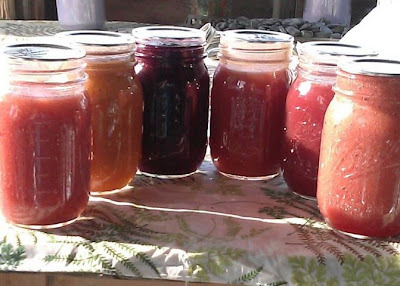 There is a rainbow of colors that you can make from your standard applesauce using additional fruits from your farmer market or store. 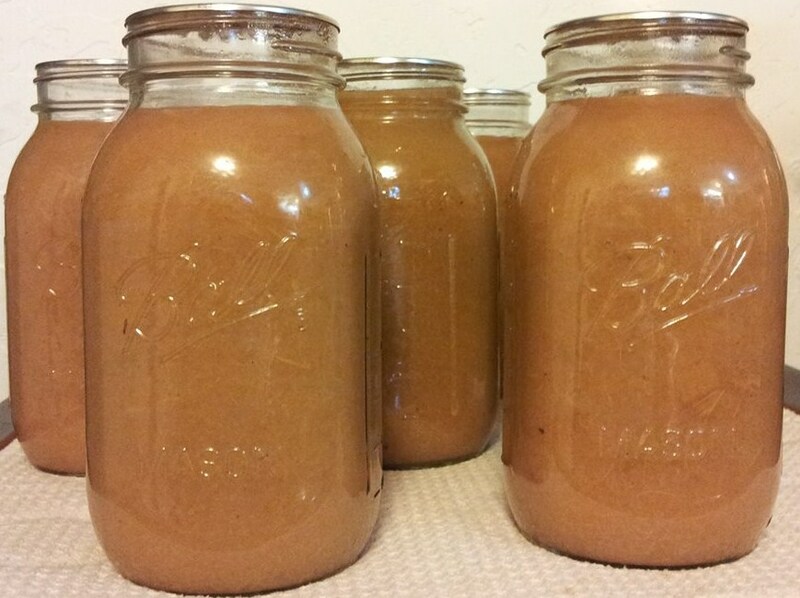 Several of my followers have made a great array of gorgeous jars of flavored applesauce with a very simple recipe. I wanted to share some of these beautiful works so that you might give your family a twist to their usual staple from the pantry. Below are the recipes from Lisa for strawberries, blueberries, raspberries, plums, cherries and a peach & apricot applesauce. 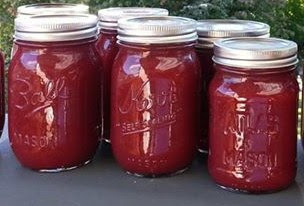 Also you will find an adapted recipe that Sarah used from Cooks.com to create a deep burgundy cranberry applesauce. And lastly Charlotte made a tantalizing rhubarb version that is rich in color and flavor. Pint size jars: About 13½ pounds for 9 pints. Use apples that are sweet, juicy and crisp. For a tart flavor, add 1 to 2 pounds of tart apples to each 3 pounds of sweeter fruit. Check out my list of apples and the best type(varieties) for making applesauce. Wash, peel, and core apples. If desired, slice apples into water containing ascorbic acid or bottled lemon juice to prevent browning. Placed drained slices in an 8- to 10-quart pot. Add ½ cup water. Stirring occasionally to prevent burning, heat quickly until tender (5 to 20 minutes, depending on maturity and variety). Press through a sieve or food mill, or skip the pressing step if you prefer chunk-style sauce. Sauce may be packed without sugar. If desired, add 1/8 cup sugar per quart of sauce. You can add brown sugar in place of regular white sugar. Taste and add more, if preferred. Reheat sauce to boiling. Fill jars with hot sauce, leaving ½-inch headspace. Adjust lids and process for 15 minutes for pints and 20 minutes for quarts. Preparation: Prepare 5 pints or 2 quarts and 1 pint (this will be adjusted for more jars if you add a lot of sugar), lids, and rings. Sterilize the jars and keep them in the hot water till it’s time for processing. Make sure to fill your water bath canner and get the water to a simmer. Cooking: In a large stainless steel or enameled dutch combine applesauce and additional fruit. Cook down till all fruit is at the “sauce” stage (If not pre-cooked). Run through food mill or mash by hand. You can leave the texture chunky if you desire. Add sugar (optional) to taste based on sweetness of fruit. Start with 1/8 cup sugar, stir into mixture, then taste. Add additional till the flavor desired. You can also add spices at this point if desired such as cinnamon or nutmeg. Bring to a boil and remove from heat. Filling the jars: On a dishtowel place your hot jars and using your funnel in each jar fill leaving 1/2” headspace. Taking a clean papertowel wet it with warm water and wipe the rims of the jars removing any food particles that would interfere with a good seal. Using your magic wand extract the lids from the hot water and place them on the now cleaned rims. Add your rings to the tops of each of the jars and turn to seal just "finger tight". Processing: Make sure your rack is on the bottom of the canner and place the jars in the water bath making sure that the water covers each of the jars by 1 to 2 inches. Add hot water to the canner if it doesn't measure up. Cover the pot and turn up the heat under the canner and wait for the water to start boiling. 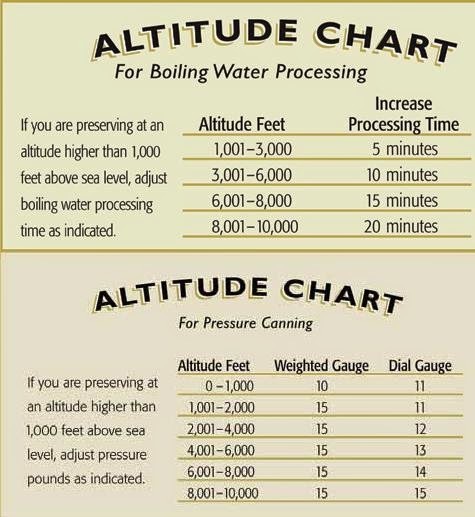 Once the water has come to a boil start your timer for 20 minutes. When complete turn off the heat and remove the cover and let the jars sit for another few minutes. Remove the jars and place them back on the dishtowel in a place that they will sit overnight to cool. Do not touch or move them till the next morning. Labeling: Make sure to label your jars after they have cooled with the name of the recipe and the date canned. If you want to use the shrink labels you can order them Here! Preparation: Prepare 6 pints or 3 quarts (you can adjust for more jars if you add a lot of sugar), lids, and rings. Sterilize the jars and keep them in the hot water till it’s time for processing. Make sure to fill your water bath canner and get the water to a simmer. Cooking: In a large stainless steel or enameled dutch combine apples and water. Cook with cover until almost tender. Add cranberries and continue cooking until cranberries burst. Run cranberry apple mixture thorough food processor or food mill. Add sugar (if desired) and heat till boil. Add sugar (optional) to taste based on sweetness of fruit. Start with 1/8 cup sugar, stir into mixture, then taste. Add additional till the flavor desired. Use “Filling, Processing, Sealing and Labeling” instructions above! Preparation: Prepare 1 quarts or 2 pints , lids, and rings. Sterilize the jars and keep them in the hot water till it’s time for processing. Make sure to fill your water bath canner and get the water to a simmer. Cooking: In a large stainless steel or enameled dutch combine In a pan, place the chopped rhubarb and the chopped apples with the water. On medium-high heat, uncovered, bring the mixture to a boil. Immediately reduce heat to low, and allow the mixture to simmer for about 20 minutes, with the lid on part way. Stir occasionally. When the rhubarb and apples are tender, remove the pan from the heat, and add the sugar. Using potato masher, mash the apples with the rhubarb. Bring mixture to a boil and remove from heat. Use “Filling, Processing, Sealing and Labeling” instructions above!